Diva's math tutor, Veggie Girl, is a Peeps-a-holic. She is crazy about Peeps and she's one of those Peepsters. You know, the kind that like Peeps old, stale, and crunchy. I know, gross. 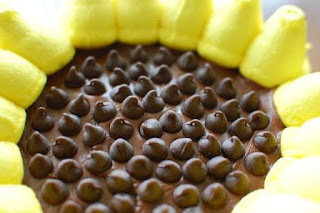 If you have a Peeps-lover in your household, this would be such a great dessert for an Easter gathering. Here's the deal, you can make any flower that you'd like not just a sunflower. If I can make a presentably decorated cake, then as long as you have an ounce of craftiness, then yours will look awesome. I have this pinned on Pinterest, but haven't made it yet. I think I'll have the girls make it! What a great idea! It is so simple and the girls will love decorating it. I have this pinned too. I will be making it this weekend. Have a Happy Easter! What an adorable Easter Treat, it is just the cutest thing. 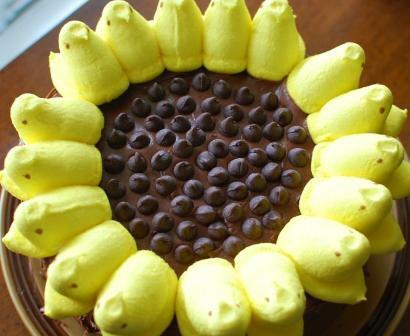 Hope you have a fabulous Easter Celebration Week End and thank you so much for sharing with Full Plate Thursday. Happy Easter to you too Miz Helen!